If you have read some of my other blog posts, you will have noticed that I usually start with a short text providing context for the subject at hand. But sometimes, I simply fail. Sometimes, not even the pen of Dickens, Milton or the Great Bard himself could do justice to the truth. Sometimes, words are not enough. This, I think, is one of those times. I do not know how to prepare you. I do not know how to soften the blow. The only thing I can suggest is that you cast your eye on the image below and marvel. 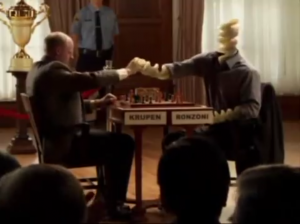 Marvel at the sight of a giant rotino playing chess. UN: Krupen’s knight is pinned. What a brilliant move by Ronzoni! Obviously, black’s knight is not pinned, but even if it had been he would probably be more concerned with the fact that he’s been checkmated, which is a rather serious affliction in chess. I’m also not sure how the previous move could possibly have been brilliant. It was a mate in one, for God’s sake, that should not be too hard to figure out. Certainly not as hard as figuring out how this position came about. The positioning of the kings suggests opposite side castling, but the rooks on b1 and h8 contradict this. 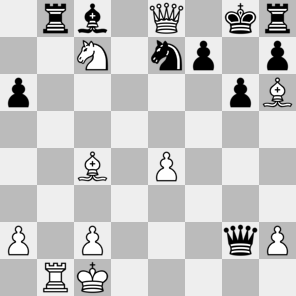 Black’s queen probably ended up on g2 after wining an exchange on h1, somehow. But this expedition, as is so often the case, turned out to be too expensive. Like tagliatelle ai porcini. Realism: 3/5 The fact that I can actually come up with more or less reasonable explanations means that this is leaps and bounds ahead of the usual fare on this blog.